Five people were killed, including a child, in a fiery crash on I-65 near Lafayette, Indiana, involving two semis and at least three other vehicles. LAFAYETTE, IN -- Five people, including two children, were killed in a fiery crash that shut down a 20-mile stretch of I-65 near Lafayette, Indiana, for several hours. Indiana State Police responded to a report of a crash on southbound I-65 near mile marker 178 around 11:55 p.m. Thursday. Five people, including two children, were killed in a fiery crash that shut down a 20-mile stretch of I-65 near Lafayette, Indiana, for several hours. A semi owned by an Elmwood Park, Ill., company, carrying frozen chicken wings, slowed for construction before the crash. A Honda Pilot and a Toyota Yaris slowed behind the semi. State police said a tanker carrying cooking oil failed to slow for construction and struck all three vehicles. State police said the tanker is owned by TXM, Inc. in Lockport, Ill. The Toyota was pushed into a ditch. The impact killed the driver, 41-year-old Mikhail Yuryevich Stepanov of Lafayette. His passenger, 31-year-old Tatiana Yuryevna Stepanova of Lafayette, was injured. The Honda spun into the median. The tanker slammed into the semi and caught fire. The Honda, still spinning, crashed back into both trucks and went up in flames. By the time emergency crews arrived at the scene, all three vehicles were on fire. Jill E. Buck, 47, of Greenwood, Indiana, was driving the Honda. Her two sons, 8-year-old A.J. and 10-year-old Branson, were also in the SUV. Ruslan Pankiv, 34, of Lake Zurich, Ill., was driving the tanker. They were all killed in the fire. 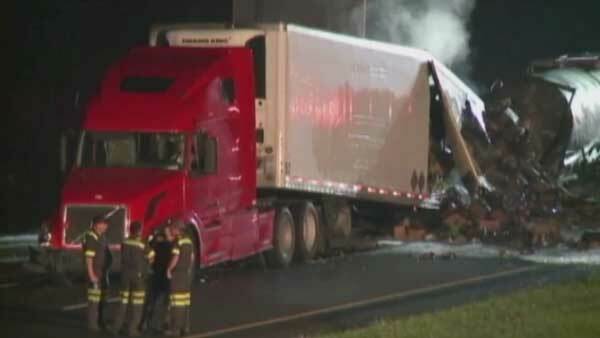 The driver of the semi survived the crash. State police said three other vehicles were also involved in the collision, but sustained only minor damage. All lanes of southbound I-65 are closed between Route 43 and U.S. 231 for the crash investigation. They are expected to open between noon and 1 p.m. Friday. The northbound lanes reopened around 6:20 a.m.